FinFolio integrates with CRM, planning, analytics, productivity and other apps. 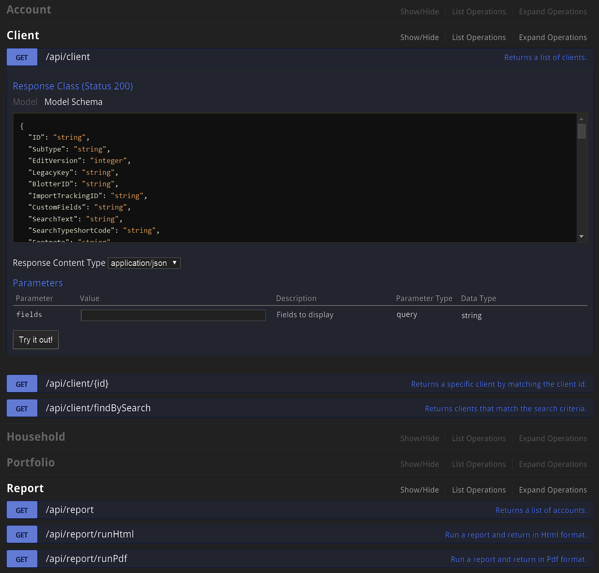 Developers can access a well-documented REST API with data and business logic. Integrations with third-party apps like CRM and planning software. Why would you need anything besides FinFolio? Maybe you won't. But if you do, we've got you covered. FinFolio can integrate with most third-party apps and services. If you already use a rebalancer and don't want to switch, we can sync your data before you trade. If you have planning system or CRM we can work with those too. FinFolio gives developers the hooks to access us programmatically. We have a well documented REST API for *all* functions, from data reading/writing, to rebalancing, to reporting, to imports. How reliable is it? Our own app uses the REST API for everything it does. Want to get crazy? FinFolio was built to be customized. Core functionality can be extended by inheriting from base classes and implementing interfaces in any .Net language like C# or Visual Basic. Add new calculations, filters, or groupings that immediately show up everywhere in FinFolio including on reports and views. Automate repetitive processes with scripts. If you decide to host FinFolio yourself, use sophisticated tools to automate and schedule important processes like your daily imports. 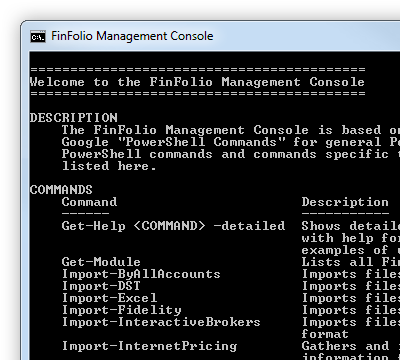 FinFolio is compatible with Microsoft PowerShell™, Microsoft's powerful task automation framework. It has a both a command-line shell and scripting language. PowerShell™ is integrated with the .NET framework and third-party tools allow for visual editing and advanced automation.